Last time I wrote for GeekOut South-West I spoke of my new favourite hobby, Gunpla aka Gundam Plastic Models. Since then, I’ve built several models and even completely customised another, which I’m presenting to Timlah at some point in the future as a gift for, well, everything. Timlah’s notes: Thanks Kev! It looks awesome!! But I realised that something was missing from the primer I wrote last time, some additional information on the resources you can use if you’re diving into the world of Gundam model kits, how useful they are and my own recommendations. So that’s what we’ll focus on for today. Before I jump into the helpful resources, I’d like to state that you should avoid Gunpla.co.uk at all costs. I ordered one of my first kits from this site and not only did the delivery take weeks longer than promised, but the site’s support was appalling and they only replied once I issued a reimbursement order on PayPal. With that little unpleasantness out of the way, let’s go into the sites, shops and channels I recommend for purchasing Gunpla and related material, as well as learning important information. It would be remiss of me not to begin with the official site, which is available in English as well, and has a simple registration process. 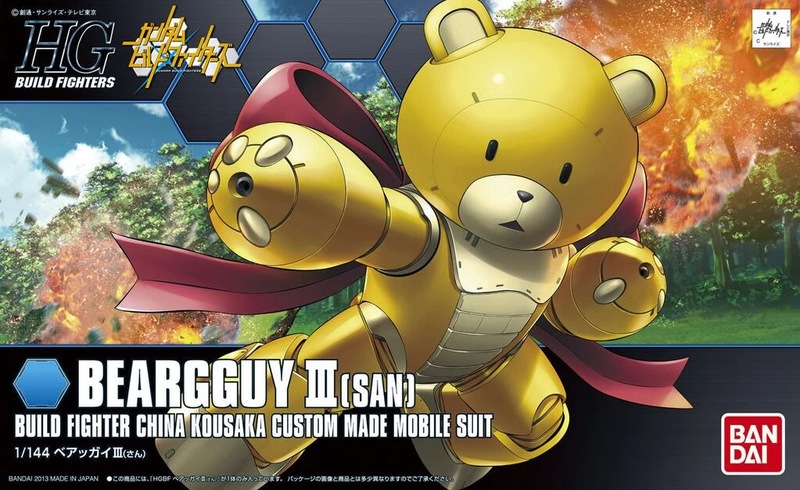 Boxart for the Gunpla of Bearguy! This site has everything on the Gundam series and product lines, from TV and Film to card games and Gunpla. On the Gunpla side of things it has listings of every model that’s ever been released and those coming soon, with detailed product information and even prices, though you can’t buy anything from the site. Better yet is its YouTube channel which regularly streams Gundam series both subbed and dubbed, thanks to which I finally managed to catch up with Gundam: The Iron Blooded Orphans season 2. But when it comes to Gunpla it has in-depth guides on every aspect of building a kit, from unboxing to painting gradients using airbrush. Better yet, the one giving out the lessons is Master Katsumi Kawaguchi, a man almost synonymous with Gunpla in Japan, and awared the title of Meijin which roughly translates to “Brilliant Man” or simply put, Genius. There are UK-specific Gunpla sites, the best among them being Japan-Cool and GundamMad and they have a great presence in UK conventions and festivals, but when it comes to stock and pricing, I’m not that much of a fan. Stock in particular is an issue and it’s very common for both sites to be out of stock on whichever model I’m hunting next, and if I find it, the prices can get rather steep. Gunpla on sticks – drying from their first layer. That’s why I now buy directly from Hobby-Link Japan, a Japan-based hobby store with fantastic stock, most models readily available and they always have offers and discounts running, especially during the holidays when it’s not unusual to see Gunpla and related tools and materials going at half price or even lower. Delivery comes in two flavours, standard aka slow, which takes a couple of weeks, or express aka a few days. Express is of course more expensive, but for the speed of delivery and the fact it’s handled by courier companies like FedEx, I’m willing to dish out the extra few thousand Yen. Now this is a site I found only recently. You won’t find any Gunpla models here but what you will find is an amazing stock in paints, brushes, markers and every other tool you might need in building or customising your Gunpla. 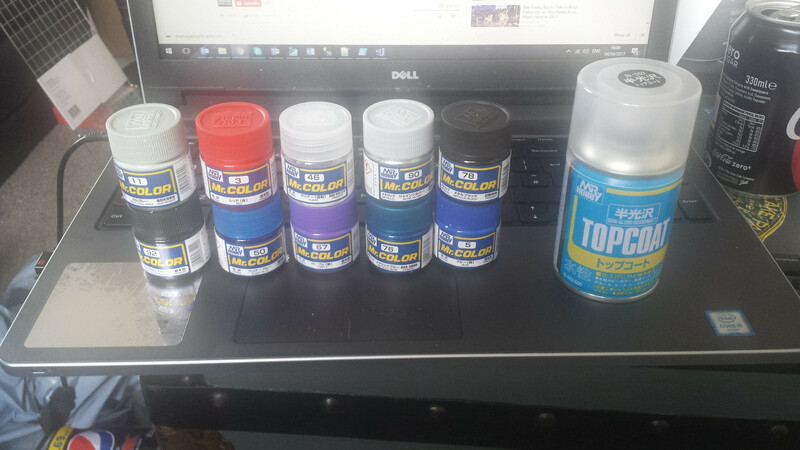 Vital for your Gunpla building needs – Paints! And the prices are fantastic. I spent about £40 and got about 6 different paints, thinner, top coat sprays and other knickknacks without which my latest project wouldn’t have happened. The delivery is pretty fast, usually through DPD at an extra £5 to your order but arrives in a couple of days. I had to mention this one, you know I did. If you need something that the above can’t cover, our Amazon Overlords will take care of you. It’s where I got my airbrush kits and compressor, the cleaning pot and rebreather mask (trust me, you don’t want to vent acrylic paint and clean your airbrush without that little pot and you don’t want to be breathing in all that paint), for a nice price and next day delivery if you have Amazon Prime, which you should because it’s totally worth it and I’m not just saying that because I’m slightly addicted to Amazon. Layered up in paint and good to go! So, there you go, hope those sites & channels help you out with all your Gunpla needs. If you need anything else or have a question, hit me up in the comments or let me know on Twitter @TheLawfulGeek. This entry was posted on April 21, 2017 by GeekOut Team. It was filed under GeekOut discussion, Guest Post and was tagged with Amazon gunpla, Gundam, Gundam Plastic, Gunpla, gunpla paint, Gunpla UK, how expensive is gunpla, How to get into gunpla, Japanese, Japanese Culture, Lawful Geek, The Mental Attic, what is gunpla, Where can I buy gunpla paint.